This page updated: May 28, 2018. Based on an article written by Bonita Hutcheson and edited by Thea Hutcheson for "Sheridan Celebrates" in 2002. Additional information provided by the South Suburban Park and Recreation District and Margaret Meyers for the original article. All parks in the city of Sheridan are maintained by South Suburban Parks and Recreation District. Four parks are owned by the city, four by South Suburban Park and Recreation District and one by the school district. The Sheridan Square Park will be the fith park in the city owned by South Suburban. Alice Terry Park is located at West Quincy Avenue and South Irving Street. The address is: 4485 S. Irving Street and is owned by South Surburban . The land for this eight-acre park was originally purchased in two parcels by the Sheridan School District in 1958 and 1966. The properly was first leased to the South Suburban Park and Recreation District in 1971. One parcel was deeded to South Suburban in April 1973. Improvements were made in 1974 with a grant from the Colorado Division of Parks and Outdoor Recreation with a matching share from South Suburban. The second and remaining portion of land was deeded to South Suburban in 1980. The park and adjacent elementary school is named after Alice Bodine Terry. Alice taught at Fort Logan Elementary School starting in 1932, later she became the Principal, and then finished as the Superintendent of the elementary school district in 1961. Barnes Park is located at 1900 W. Girard Avenue and is owned by South Suburban. Barnes park is 1.3 acres in size and was used by the Sheridan Volunteer Fire Department for many years. Work was completed on the park by the volunteers the 1960s. On June 16, 1968 the volunteer firefighters dedicated Barnes Park. The property was owned by Dr. Brodo and Charlotte Barnes. They leased the park for fifteen years to the City of Sheridan on July 15, 1972. On September 30, 1980 the park was subleased to the South Suburban Park and Recreation District which allowed the District to further develop the park. The park was subsequently deeded to the South Suburban Park and Recreation District by Dr. and Mrs. Barnes in 1983. It has a wooden pole fence around the exterior and playground equipment in the northeast corner. The "Sheridan Celebrates" fair was held for the first time in this park beginning in 2002. Bobcat Park is located in the 3000 block of W. Bear Creek Drive and is owned by the City of Sheridan. Land for Bobcat park was donated to the City of Sheridan by June Francis. Community volunteers along with city staff and council members helped with the construction of the park. A contractor was used to for assembly of the playground equipment. Approximate costs for playground equipment, landscaping, etc. were approximately $92,000.00 of Conservation Trust Funds from state lottery proceeds. Additional donations were provided by Concrete Foundations in Sheridan, Jack Eitezel, and The Fraternal Order of Police. The design was provided by Columbine Design in Sheridan. The park is maintained by the South Suburban Park and Recreation District. The park is named after the old Fort Logan Elementary School mascot Bobcats. The park is maintained by the South Suburban Park and Recreation District. Chase Park is located at 2750 W Princeton Place and is owned by South Suburban. Chase Park is named after Mr. Douglas Chase. The Chase family at one time owned all of the land south of Oxford Avenue and east of Federal Boulevard and had a turkey farm. Doug and Elva Chase and their four children; Dolores, Brian, Gary, and Karen operated a turkey farm on Oxford and Federal for many years. The children all attended Sheridan School District. The business required the entire family to work together to watch over the newly hatched turkeys to keep them at the right temperature, from piling up and smothering, maintain proper food and water, and ensure their pens were clean.People came from all over Colorado to get their Thanksgiving and Christmas turkeys from the Chase farm. The many hours butchering and filling orders for family dinners kept them busy. Doug and Elva closed their turkey farm and sold the land to a developer who subdivided it for the Rose Gardens Subdivision. Their farmhouse was moved to 4245 S Dale Ct. Doug and Elva moved to one of the new homes at 4195 S Eliot St in 1963. Of the Chase family only Karen, who lives in Kansas, and Dolores, who resides in the Parker area survive. A portion of the farm later became the Rose Gardens subdivision. Property for the park was deeded by Douglas and Elva Chase to the City of Sheridan on March 26, 1973. The original park was one acre in size. It was subsequently deeded by the City to South Suburban Park and Recreation District later that year. A second portion was deeded to South Suburban in 1983 by Woodlawn Investments. Additional adjacent property was purchased in 2015 by the City of Sheridan. Nesbitt Park is located at 3025 W. Mansfield Avenue and is owned by South Suburban. The site for Nesbitt was part of the Denver and Rio Grande Western Railroad spur line to Fort Logan. The land was vacated by the railroad to the City of Sheridan on June 22, 1966. It was later deeded to the adjacent land developer by the City on May 24, 1972 for the purpose of a park. It was then subsequently returned to the City. A neighborhood picnic area of .29 acres was developed by the City and named to honor Maurice Nesbitt. The park was deeded by the City to the South Suburban Park and Recreation District on April 12, 1990. The park is named after Maurice Nesbitt. Mr. Nesbitt served as the Sheridan town clerk in late 1940s. He was also on the town Board of Trustees in 1957 and 1958. Mr. Nesbitt was a volunteer fire fighter for 35 years and served as the secretary for the volunteers. Persinger Park is located at 3340 S. Dale Court and is owned by the City of Sheridan. Persinger Park is part of two parcels purchased by the City of Sheridan. The park portion cost $125,000 and was purchased on September 8, 2006 from the estate of Erma Persinger with an Open Space Funds Grant from Arapahoe County (Lottery Proceeds). Park landscaping, playground, and shelter were paid with $135,000 from an additional Arapahoe County Open Space Funds grant with construction completed by the South Suburban Park and Recreation District in May, 2009. The park opening was celebrated on October 3, 2009. The park is named after the Persinger family. The park is maintained by the South Suburban Park and Recreation District. Sheridan Community Park is located at 3201 W. Oxford Avenue and is owned by Sheridan School District #2. The South Suburban Park and Recreation District has a joint use agreement with the school district through April 20, 2027 for this 34 acre park. This area was acquired by the Fort Logan military post from The Fabian Company in the early 1900's. The post was decommissioned in 1946. The school made a grant request for the land in 1957. The land was deeded to the school district by the Federal Government in two parcels. The first in 1958 and the second in 1960, provided the school district met all of the conditions of the 1957 grant request. Around 1959, Ora Oliver Elementary School was built on part of the land to provide a school for the military and government employees, who had moved to the area. The swimming pool was built in 1969. The pool was closed in 2009. The high school was built in 1972. The Recreation Center and park improvements were built by proceeds from a two million dollar Federal Economic Development Administration grant in 1977. The park was dedicated in June, 1978. A subsequent grant was obtained for the skate park. Ora Oliver was subsequently replaced by Fort Logan Northgate School. Besides the Recreation Center there is a picnic shelter with rest rooms; tennis courts, playing fields for baseball, soccer, football, and a skate park. The school district has priority use of all the facilities in this park. They use the park during the day and South Suburban uses it for evening and weekend programs. The park facilities are maintained by the South Suburban Park and Recreation District. This park is part of the Sheridan Square, Habitat for Humanity Project. The park will be located at South Julian Street and Lehigh Avenue. This is a joint project of Habitat for Humanity, City of Sheridan, and South Suburban Park and Recreation District. Once completed the park will be owned and maintained by South Suburban. This park is 8,600 square feet and will separate play grounds for kids fro 2 to 5 years of age and 5 to 12 years of age. It will include a half court basketball area and a shelter area and picnic table. Veterans Park is located on the southwest corner of Oxford Avenue and Hazel Court and is owned by the City of Sheridan. 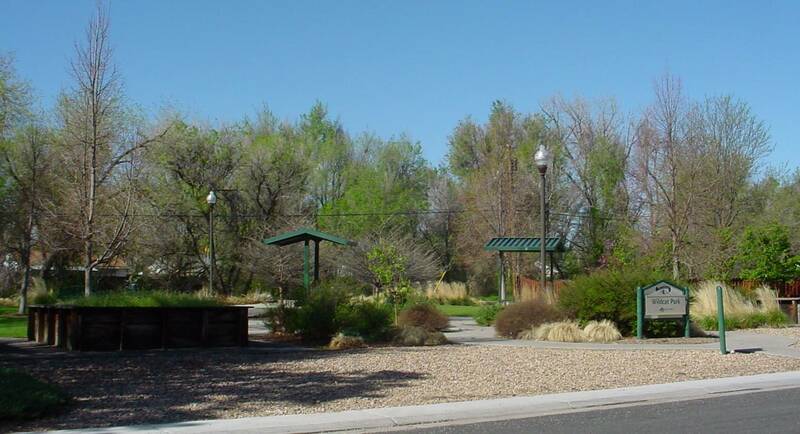 Land for Veteran's park was acquired in 2008 with a $150,000 Open Space Funds Grant from Arapahoe County (Lottery Proceeds) with a $50,600 match from the City of Sheridan. Park construction, fixtures, and landscaping were completed by the South Suburban Park and Recreation with $240,000 of Conservation Trust Funds provided by the City of Sheridan. The park was dedicated on October 12, 2015 and received it's name because of the proximity to Fort Logan. The Fort was an active military post until May, 1946. The park is maintained by the South Suburban Park and Recreation District. Wildcat Park is located at 3140 W. Jefferson Avenue and is owned by the City of Sheridan. Wildcat Park purchased by the City of Sheridan in 2005. Construction was completed by South Suburban Park and Recreation District with a $250,000.00 Open Space Funds Grant from Arapahoe County (Lottery Proceeds). The park is named after the old Sheridan Middle School mascot Wildcats. The dedication was held on September 15, 2007. The park is maintained by the South Suburban Park and Recreation District. Note: Mary Hampton Carter served as the Mayor of Bow Mar during the 1980's. This is a different person from the Mary Carter that served as the Mayor of Sheridan. This greenway runs for over eight miles through Arapahoe County along the South Platte River. It was through the efforts of Mary Hampton Carter in the early 1980's, who envisioned its value to the citizens. She took on the task of leading a group of citizens to raise money and complete the project of trails and open space. The greenway was dedicated June 23, 1996, along with a park in her honor. Bike trails are open for walkers and bikers, many trees planted and much landscaping was done. The bike trail along Bear Creek meets with the Mary Carter Greenway. River Run Park is located on the Platte River adjacent to the Oxford Avenue bridge. The address is 2301 W. Oxford Avenue. This river oriented park was a joint effort of the cities of Englewood and Sheridan, Arapahoe County Open Spaces, South Suburban Park and Recreation District, Urban Drainage and Flood Control District, and the Colorado Water Conservation Board. Construction began in 2014. The design was completed by the McLaughlin White Water Group of Merrick & Company. Webmaster Note: The idea for water features for the Platte River inside the City of Sheridan originated with City Administrator Jimmy Curnes in the late 1980s. Curnes was a kayaker enthusiast and understood the dangers of using the river without the proper safety features. Some work in the river had occurred over the years. In 2008 the "South Platte River Working Group" was formed to specifically address these kinds of issues for the Platte. The initial funding for conceptual design and planning of this phase was $1,200,000 including channel improvements, cobbled beach area, and trail improvements. Phase I includes 1,000 feet north of the Oxford bridge south to 500 feet past the Union Avenue bridge. Total Phase I costs were $3,092,000 with the City of Sheridan contributing $250,000 and with the greatest share of $1,546,000 coming from Arapahoe County. The in water facilities for surfers, kayakers, and tubers include the upper wave "Benihanas" which is geared for advanced surfers. The lower wave "Chiclets" is geared for beginners. The first high flows were featured in 2017. Upper river waves are still under construction as of 2018. Helmets are protective floating devices are encouraged when in the water. The park also has picnic area features on the east bank of the river just north of Oxford Avenue. The park at this point is ADA accessible with the ability of wheel chair users to reach the river's edge. Harmony Park is located at 3370 S. Irving Street and is owned by South Suburban. The Arapahoe County Commissioners donated the land for this park, as well as $140,000 in funding, for the development of a park including a multi-purpose field and a state-of-the-art playground. On Thursday, May 30, 2002 from 4:30 to 6:30 p.m., Sheridan school children, transitional housing residents, public officials and other community members came together and participated in the park's development by drawing a playground design. A hot dog dinner was served. "Together we continue to improve the quality of life for citizens in the south metropolitan community." The park at Sheridan Middle School is 2.3 acres and has one lighted ball field. In 1993 South Suburban took this park over. It is south of the school at 4107 South Federal and does not include the Football field. Copyright &COPY; 2018 by the Sheridan Historical Society, Inc.